The high usage of advanced technology, globalization, effective methods of communication etc., all together is taking the world and the people in it, on to a highly developed era. With these changes taking place it has become very important in highlighting the importance of ethics and its implications. This report will focus on the highly important role played by ethical issues, in conducting a research at a UK University. 2.0 What are Ethical Issues? Ethics play a very important part in research. Ethics has been defined in many forms by different authors. Billington (2003), define ethics as the distinction between the right and wrong along with the link of moral connected with the human behavior. The British Psychology Society (2014), define research ethics as the “moral principles” that carry a research from the initiation to the final that involves releasing or publicizing the results of findings. In conducting research different ethical issues will arise at different stages (Sanders, Lewis & Thornhill., (2009). It is the responsibility of the researcher to ensure that the ethical issues are addressed at each stage for fair research results. Conducting research involving human and living beings has a long history. Due to the reports received on human exploitation in these researches after the 1940’s codes, laws and regulations relating to such researches were introduced (Fouka & Mantzorou, 2011). This was to ensure that the best practices were followed at any given time in conducting research. Just like many organizations when students are conducting research for UK Universities it is important to understand the governing policies and the Ethical Codes of Conducts that is connected with the university policies. The universities have their own Ethics Committees and a special Departmental Research Ethics Officer who will be supporting the students when issues arise in relation to ethical issues in conducting research. The universities expect students to be well aware of the following Acts in order to understand the ethical guidelines in carrying out a research. Further the British Educational Research Association provides ethical guidelines required for an educational research. Hence it is important that research conducted for a UK University is following the above in order to accept the results of the research. Following are three main areas of concern when focusing on following ethical practices. Honesty and integrity is been considered as one of the most important areas of concern (Science Europe, 2015). Honesty is being more about truthful and frank, integrity is more in relation with the moral aspect and ethical practices. Hence being integral is important in conducting research. Why Honesty & Integrity is Important? By conducting a research it is expected to provide information that carries value. Therefore many parties will depend on the results in conducting further research, concluding findings and encouraging focusing on related areas. The European Code of Conduct for Integrity is been developed to highlight the importance of ensuring the professionalism maintained throughout the research conducted. Further in a global aspect Singapore Statement on Research Integrity and Global Research Council Statement of Principles on Research Integrity, focuses on the importance of maintaining integrity in a research. This shows what important part integrity plays in relation to research. The main motive behind developing these codes of conducts in relation to integrity is to ensure that the research conducted has followed high standards and that it at any given point has not caused a risk to any party or will cause any damage. With all these guidelines still research misconduct take place. According to a survey conducted using 194 fresh medical consultants the following was identified. 5.7% admitting to personal misconducts carried out in the past. 55.7% admitted for witnessing misconducts carried out by colleagues. 10.8% admitted they had an expert knowledge in altering and fabricating data. (Science Europe, 2015). The misconducts in research take place in many forms. And following are few that impact the honesty and integrity of the research. Therefore as a researcher paying attention to all this is very important for integrity in the research conducted. While many actions has been taken by governments and universities to ensure the standards and quality of research, it is the responsibility of the researcher to ensure that the guidelines are strictly being followed and further the Acts and regulations relating to the subject matter is understood very well before conducting the research. This will allow the researcher to conduct a research that will be more impactful and useful for many parties. In conducting research it is important to have knowledge on the intellectual property rights (IPR). What is Intellectual Property Rights (IPR)? In preparing to conduct research it is important for the researcher to understand and have a clear view on the IPR relating to the research topic. IPR allows the owners or the creators to benefit from their own work. The Intellectual Property Act 2014 in UK was created in order to highlight the provisions in relating to intellectual property. This Act speaks of the IPR that a creator has and how the work of another party needs to be given due respect in using the finding for another research. 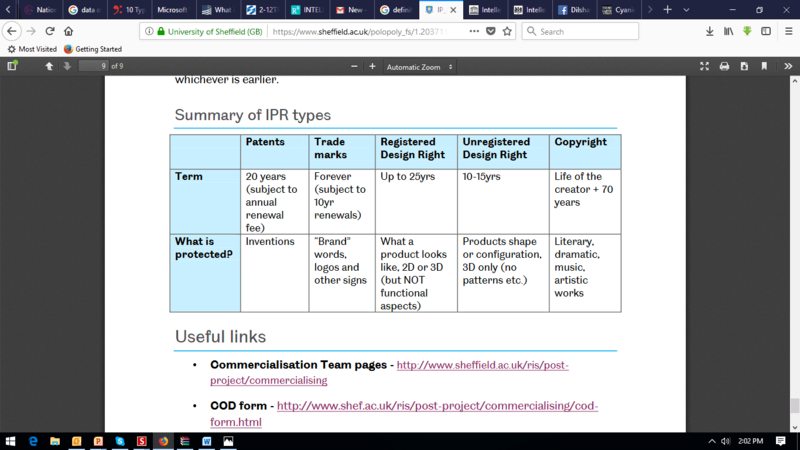 The researcher should be aware of the following in using intellectual property (adopted from The University of Sheffield, 2018). In providing the due respect for the creators of the intellectual property used in the research the following should be considered. It is important that the researcher uses the correct referencing in acknowledging the intellectual property used. During the period of preparing for the research, the researcher should prepare what sort of IP will be used in the context. This will allow the researcher to identify how the information needs to be collected, which will need prior approval, what parties should be addressed in clarifying certain information etc. Certain IP required for the research such as publication, using of logos etc., might require prior written approval. Hence the researcher should conduct a background research in order to identify such requirements before conducting the research. Hence having this understanding will allow the researcher to conduct the research with more positive impact. Plagiarism has become a very common issue in the resent academic world (Shahabuddin, 2009). When speaking of plagiarism it has been identified by authors that there are many similarities in certain articles published. According to the definition given in the Oxford Dictionary, plagiarism is the act of using another parties work as of your own work without providing the due respect. There are different types of plagiarism. This is where the author will copy exactly the same wording one by one of another author. This is known to be the most common type. Universities are very concern about direct plagiarism. This is considered as an unethical practice and many educational centers take very strict disciplinary action on this. This is where the author will be using certain phrases and clauses from the work of another author into the research conducted as if it is his own and without giving due respect. This is a very common mistake made by students. This is where the author will be taking writings of another author and summarize and include in the current research without mentioning the source. In certain occasions writer unintentionally can make the mistake of citing wrongly. All these are considered as types of plagiarism and are treated under the code of ethical practices of the institutes. As it can be seen the level of plagiarism has been increasing at a very highlevel. This can also be linked with the development of modern technology and the information being widely available. Universities are continously encouraging students on avoiding plagiarism. This is where it is important to be honest with the work that is being conducted. There are many softwares that is being developed in order to assist with identifying the level of plagiarism compared mostly with the published previous work. In addition the universities provide the necessary support to conduct work without plagiarising. Hnece it is the responsibility of the researcher to be honest and provide original work for a better outcome. Following ethical practices in all aspects is very important in relation to research. As a researcher it will be very important to follow the ethical codes of conducts handed in by the university in conducting research. This will allow the research results to be more meaningful and realistic. 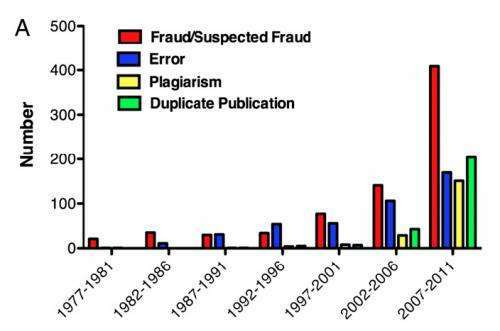 – Albert Einstein College of Medicine, (2012), Misconduct, not error, accounts for most scientific paper retractions, new study finds, [Online] Available: https://phys.org/news/2012-10-misconduct-error-accounts-scientific-paper.html, Accessed On:19th April 2018. – Billington, R. (2003), Living philosophy: An introduction to moral thought (3rd ed.). London,UK: Routledge—Taylor & Francis Group. – British Psychology Society (2014), Code of Human Research Ethics, [Online] Available: http://ethics.iit.edu/ecodes/sites/default/files/code_of_human_research_ethics_dec_2014_inf180_web.pdf, Accessed on: 18th April 2018. – Fouka G. & Mantzorou M. (2011). “What are the major ethical issues in conducting research? Is there a conflict between the research ethics and the nature of nursing?” Health Science Journal, 5 (1), pp:3-14. – Sanders, M., Lewis, P. and Thornhill, A., (2009). Research methods for business students. 5th ed. Essex: Pearson Education. – Science Euorope, (2015), Briefing Paper: Research Integrity: What it Means, Why it Is Important and How we Might Protect it, California. – Shahabuddin, S., (2009), Plagiarism in Academia, International Journal of Teaching and Learning in Higher Education, 21(3), pp: 353-359. – World Intellectual Property Organization, (2015), What is intellectual property, [Online] Available: http://www.wipo.int/edocs/pubdocs/en/intproperty/450/wipo_pub_450.pdf, Accessed on: 18th April 2018. In any research conducted the research philosophy plays a vital role. This will be more like the base of the reserch. The philosophy of the researcher is related to the way that the researcher view the world Sanders, Lewis & Thornhill., 2009). There has been many studies conducted by many authors in relation to research philosophy and in developing the research paradigms (Acheampong & Mkansi, 2012). 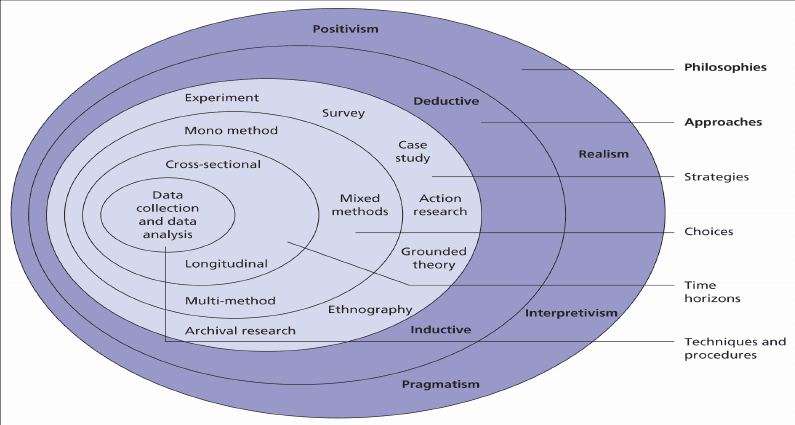 As highlighted by Sanders, Lewis & Thornhill (2009), in the research onion the first layer is identifying the philosophy of the researcher which leads to the other layers. Hence the philosophy selected will create the base and the gudance for the entire research and its outcome. The research philosophy is been discussed and defined by many authors differently. Sanders, Lewis & Thornhill., (2009), defines research philosophy as, “the development of knowledge and the nature of knowledge”. Further Crossan (2003), highlights that research philosophy is all in relation with the understanding of the researcher. Hence it is evitable that the researchers view, knowledge and understanding is what makes him lead to select the philosophy required for the research. 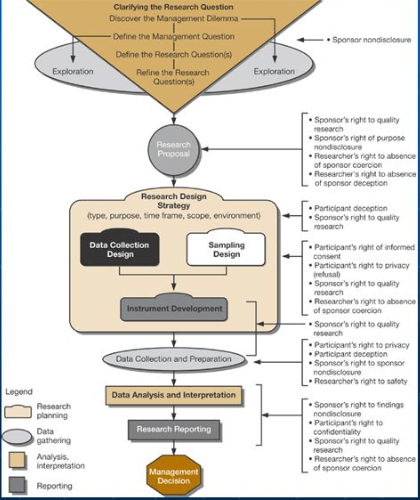 By following the appropraite philosophy, it will provide clear guidance for the researcher how the research methodology needs to be conducted. This will lead the researcher to avoid wasting time on collecting and analysing data that is not relevant aloowing the authro to have a clear focus on the research outcome. Having a clear understanding on the research philosophy let the researcher to develop the research method creatively and effectively that will lead in getting a better out come. Therefore it is clear that research philosophy have a great role to play in conducting research. Sanders, Lewis & Thornhill., (2009), uses the concept of reserch onion in providing a guidance to conducting a reserch. As disclosed in the research onion, there are several layers that need to be realised before approaching the data collection and analysing. Philosophies are the first layer which lays the foundation to the research. When speaking of research philosophies, it is been discussed about the research paradigm. The paradigm consists of Ontology, Epistomology and Axiology (Guba & Lincoln, 1994). Saunders et al. 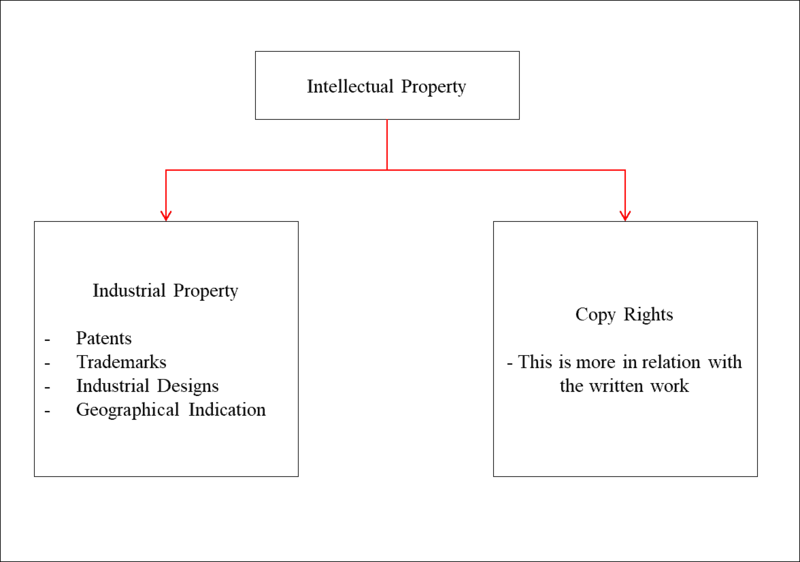 (2009), combined the definitions given by Gruber (1993) and Borst (1997) and defined ontology as the “form and nature of reality”. Epistemology discusses about the knowledge and how the knowledge will be discovered (Sanders, Lewis & Thornhill., 2009). Further axiology is been considered as another branch of philosophy that focuses on the judgemental values (Sanders, Lewis & Thornhill., 2009). Understanding this paradigm the research onion focuses on the philosophical approaches available for a researcher. Positivism is been discussed by many authors in relation to research. As mentioned by Babbie (2011), positivism has a long history. Positivism is more in relation with the studies conducted on natural sciences. As mentioned by Welmen et al. (2009), mentions that positivism can be directly linked with reseaches in relation to science, because the results can be obsereved and measured. It is identified that a positivist researcher would be interested in testing the hypothesis in an observable environment. The research will be conducted in a very structured manner. In addition large samples will be used and quantifiable data is mostly preferred by positivists (Druckman, 2005). As positivist highly believe on gathering information through observation. Therefore positivists give priority to collecting knowledeg through observation. It is mentioned by Collis & Hussey (2009), that positivist worked on developing theories. So they are focused on generalizing the theories. Realism is where the researcher accepts that when it comes to reality, it is not always depended on the behavior and the beliefs of humans (Blumberg et al, 2011). A realist believes that reality exists beyond what is in the mind of humans (Sanders, Lewis & Thornhill., 2009). Therefore in conducting research following realism will not only depend on the quantifiable data that is being collected through observation. This is where the researcher agrees with and accepts what is been seen as reality. In this scenario senses plays a vital role, as researchers agrees with whatever get caught within the senses. By using only sensations to understand the reality. By getting a mental process along with sensation to understand reality. According to the direct realist only the first step will be used in accepting reality. But as per the critical realist both the steps are needed in identifying and accepting reality. Interpretivism is more focus on understanding people and their behaviors (Babbie & Mouton, 2008). As mentioned by Sanders, Lewis & Thornhill., (2009), interpretivism is more focused on understanding the part that humans play in their day to day life. Neuman (2011), mentions that in accordance to the studies conducted by Wilhelm Dilthey, there are two sciences known as natural and human sciences. While interpretivism focuses on the human sciences, positivism focuses on natural sciences. Rubin & Babbie (2010), argues that interpretivism is used mainly to study the daily events of human life combining the values and cultures surrounding it. In conducting research an interpretivist will not be just observing, the researcher himself will become a part of the research and will be moving within the selected population (Wisker, 2008). In addition the interest of the researcher towards the study will be driving the research. According to interpretivism theory is built based on the studies that are being conducted and the results collected. Therefore the unexpected can be expected. Interpretivism research focuses more on collaborating, discussing, sharing ideas in collecting data. Hence, the approach will be more on collecting qualitative rather than quantitative data. Therefore the theory will not be developed based on quantifiable information, rather it will be on contrasting and comparing the information collected. Pragmatism is very commonly used in academic research. This is where the researcher gets flexibility in adopting the most suitable method to conduct research according to the research question (Sanders, Lewis & Thornhill., 2009). Tashakkori & Teddlie (1998), highlights that in using the philosophical approach, the researcher should focus on what interests the researcher and how the methods selected can add value to the research conducted. By focusing on pragmatism it enables the researcher to have a better focus that in addition enables collection of better results which is more relevant. In selecting pragmatism, the researcher gets the opportunity to select mixed methods (Johnson & Onwuegbuzie, 2004). This allows the researcher to have a deeper understanding of the research conducted. The data can be collected using different methods from a wider population and the findings can be studied in depth using more methods. Therefore research questions that need flexibility will adopt pragmatism, in order to add more value to the data collected. Below is the comparison table of the philosophies presented by Sanders, Lewis & Thornhill., (2009). The deductive approach is where the researcher will be focusing on the theory. The theory will be put into test through the research. 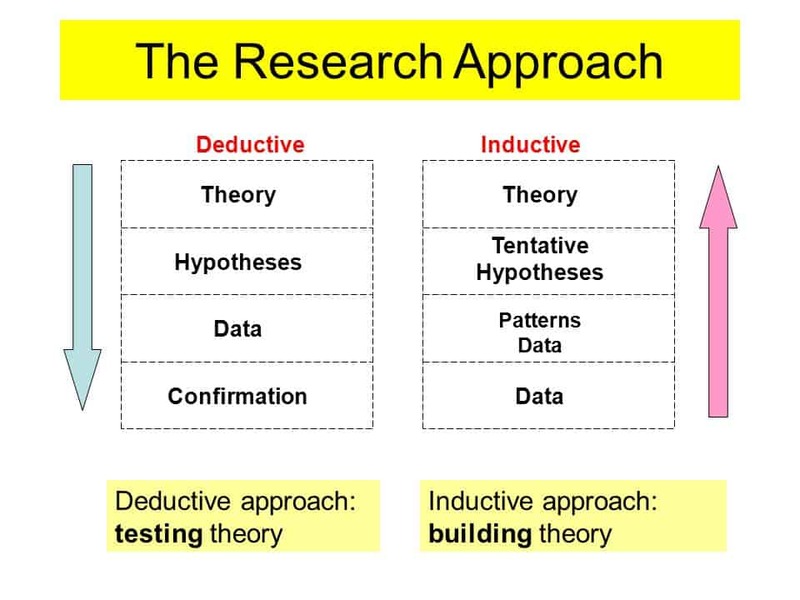 According to Wilson (2010), in using the deductive approach the researcher will be using the theory in developing the hypothesis and then the data will be collected in order to test the hypothesis. The discussion above leads to the link between the research philosophies and the research approaches. As it can be seen the selected philosophy will provide the guidance for the researcher in selecting the deductive or the inductive approach. For an example in selecting positivism which is in relation with natural sciences will be based more on testing theory. In such occasions the researcher will focus on selecting the deductive approach where the motive will be to test theory. Hence it is important to have a clear selection in the philosophy before focusing on the research approach. Therefore a researcher can use the research onion which will provide clear guidance in conducting the research. – Babbie, E. & Mouton, J. 2008. The practice of social research. 8th ed. Cape Town: Oxford University Press. – Babbie, E.R. (2011). Introduction to social research. 5th Ed., Belmont, CA: Wadsworth. – Blumberg, B., Cooper, D. and Schindler, P. (2011), Business Research Methods. 3rd ed. Berkshire: McGraw Hill Education. – Borst, P. (1997), Construction of Engineering Ontologies for Knowledge Sharing and Reuse, PhD thesis, Tweente University. – Collis, J. & Hussey, R. (2009), Business Research: A practical guide for undergraduate and postgraduate students, 3rd edition, New York, Palgrave Macmillan. – Crossan, F., (2003), Research philosophy: towards an understanding, Nurse Researcher, 11(1), pp:46-55. – Druckman, D., (2005), Doing Research: Methods of Inquiry for Conflict Analysis, London, Sage Publication. – Easterby-Smith, M., Thorpe, R. and Lowe, A., 2002, Management Research: An Introduction, 2nd Edition, London, Sage Publications. – Gruber, T., (1993), A Translation Approach to Portable Ontologies. Knowledge Acquisition, 5(2): pp:199–220. – Guba, E. G., & Lincoln, Y. S. (1994). Competing paradigms in qualitative research. In N. K. Denzin & Y. S. Lincoln (Eds. ),The handbook of qualitative research. Thousand Oaks, CA: Sage. – Mkansi, M., & Acheampong, E. A. (2012). Research philosophy debates and classifications: students’ dilemma. Electronic journal of business research methods, 10(2), pp:132-140. – Neuman, W. L. (2011), Social Research Methods: Qualitative and Quantitative Approaches. USA: Allyn and Bacon. – Rubbin, A. & Babbie, E. 2010. 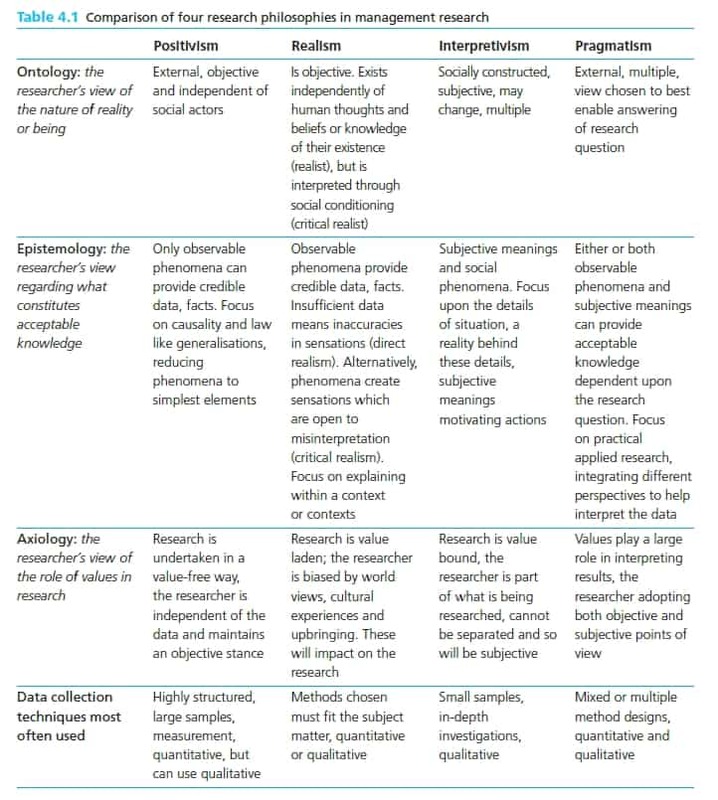 Essential research methods for social work. New York: Brooks/Cole Cengage Learning. – Tashakkori, A., & Teddlie, C. (1998). Mixed Methodology Combining Qualitative and Quantitative Approaches (Vol. 46). Thousand Oaks, CA Sage Publications. – Wilson, J. (2010). Essentials of Business Research: A Guide to Doing Your Research Project. SAGE Publications. – Wisker, G. (2008) 2nd Edition The Postgraduate Research Handbook. Basingstoke: Palgrave McMillan.